We are delighted to be celebrating our 12th anniversary this year. 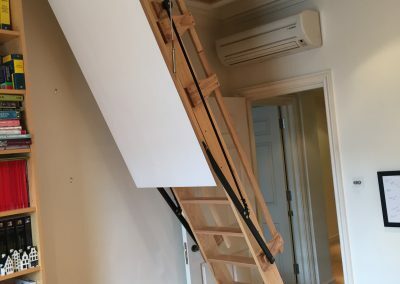 From humble beginnings with just one product, we now manufacture a range of Electric Loft Ladders to suit any purpose and design requirement. The company has grown immeasurably since we first started and yet we still pride ourselves in maintaining the simple purity and clarity of vision that we had when we first began. 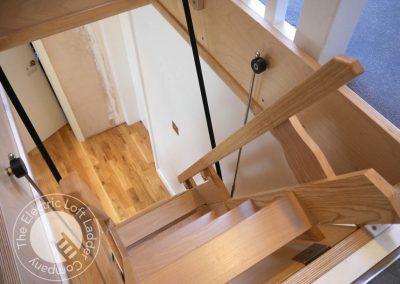 The Electric Loft Ladder Company, as part of S&T Joinery Ltd, creates handcrafted bespoke electric loft ladders that are a design feature. 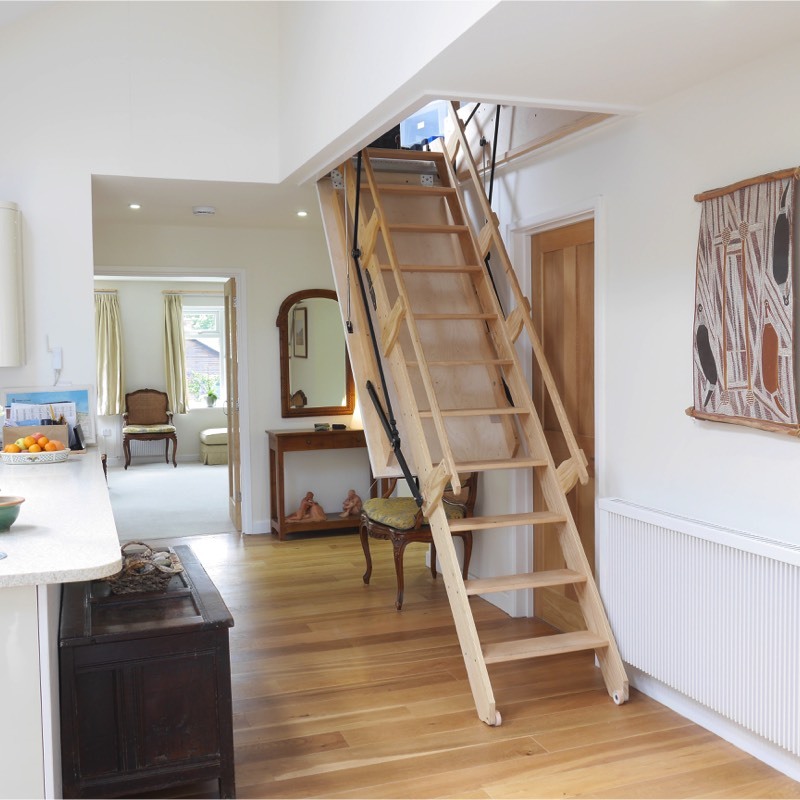 Tactile, easy to open and aesthetically beautiful, our wooden automatic loft ladders will enhance any new room without compromising on the space available. 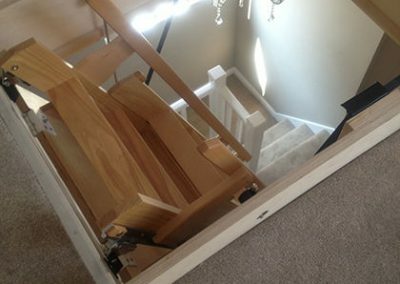 A fixed staircase is not the right solution for every project because there is not the space available, it does not give the desired look, or there may be a delay in gaining the necessary planning permissions. 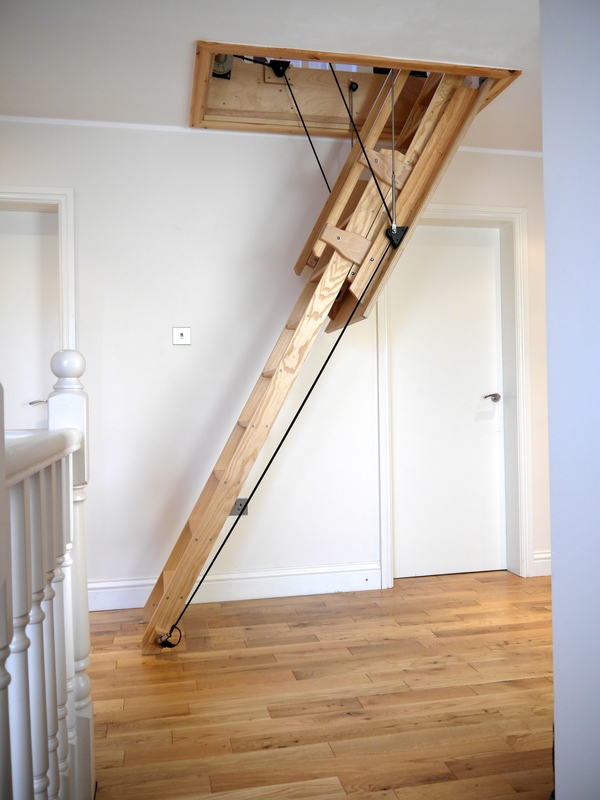 Our electric loft ladders are not a compromise; they provide an innovative, elegant solution in the way of secure access to your loft space or roof garden. 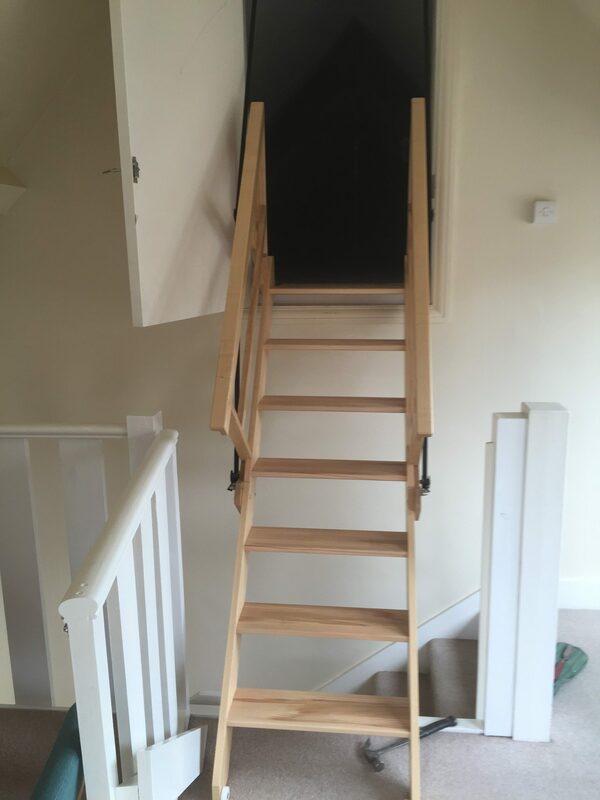 And because our electric loft ladders and stairs are made to order we can provide access to the smallest or most unconventional sized spaces. 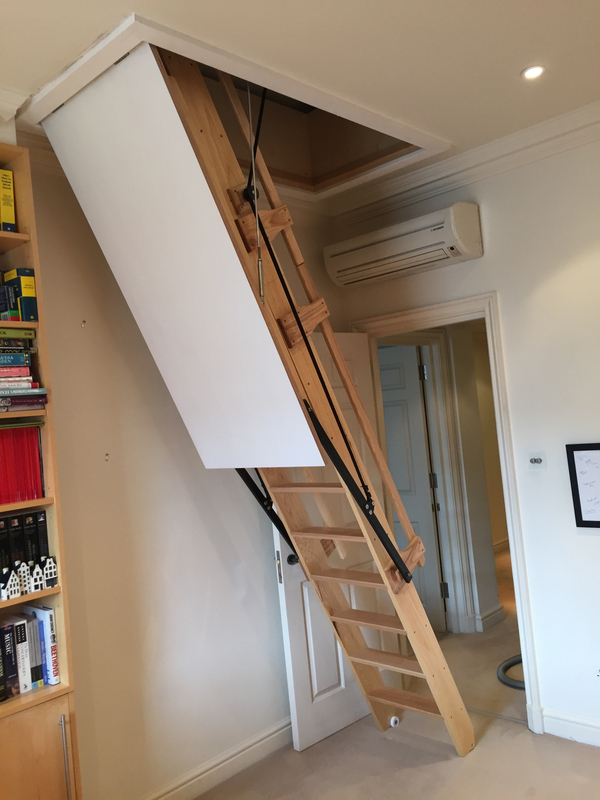 Whether you need access to an office, games room, craft room or simply that you need stable and dependable access to your loft space, the Electric Loft Ladder Company have created a design solution to a practical issue. 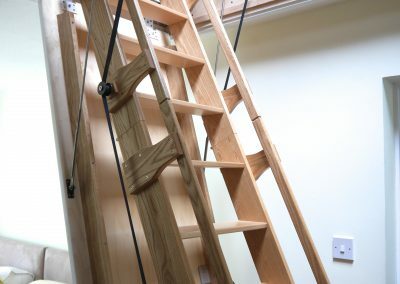 From our workshop based in West Sussex we supply across the UK and abroad, each ladder or stair being built to the customer’s unique specification. 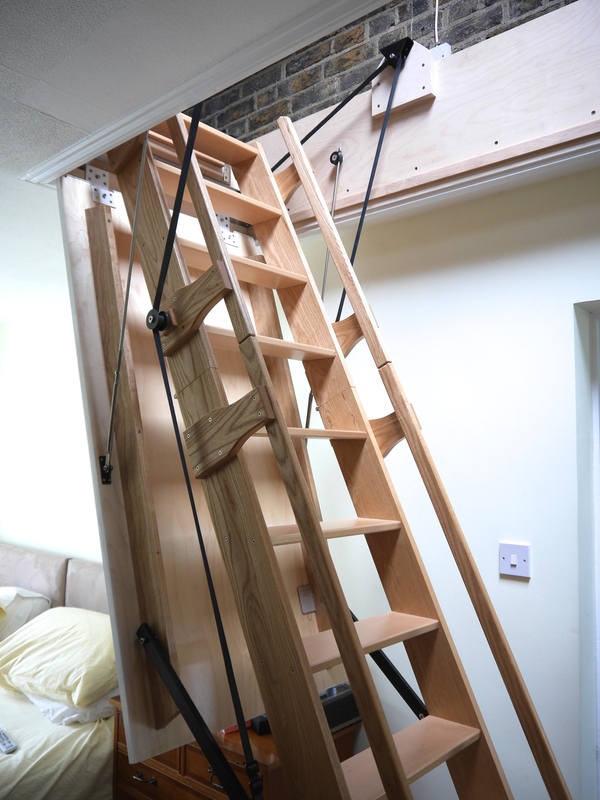 The Slindon is our entry-level electric loft ladder and comes with a set opening size, yet there is no compromise on quality or functionality. With superb ease of use it will give you stable and long-lasting loft access in your home. 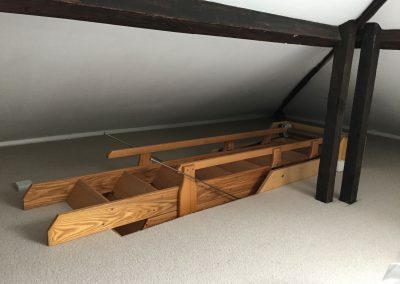 This is the nearest we get to an ‘off the shelf’ product, and has some limitations on floor to floor heights and box size. 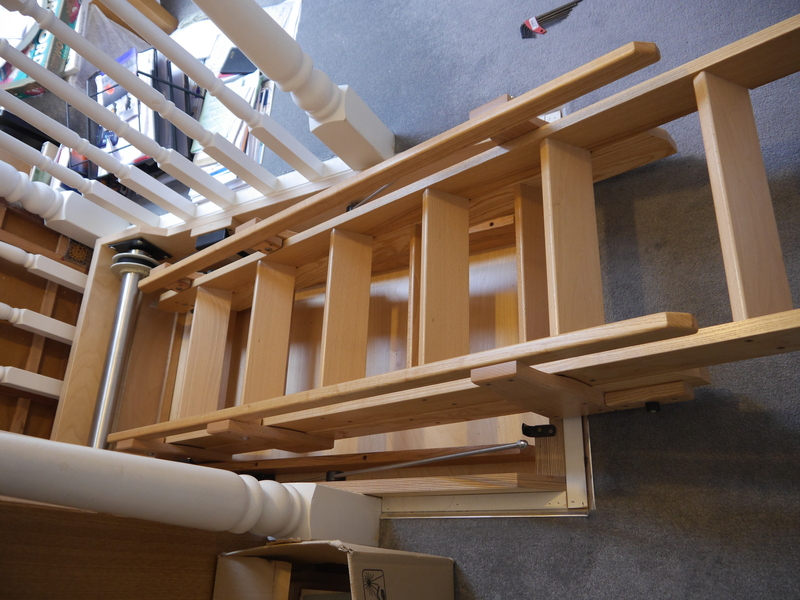 £4200 not including fitting,VAT or delivery. 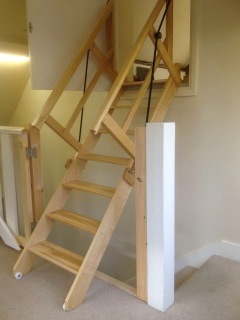 The Boxgrove was the original design for our electric loft ladder. Over time it has proved to be a consistently excellent performer, with great reliability and an eye catching design. 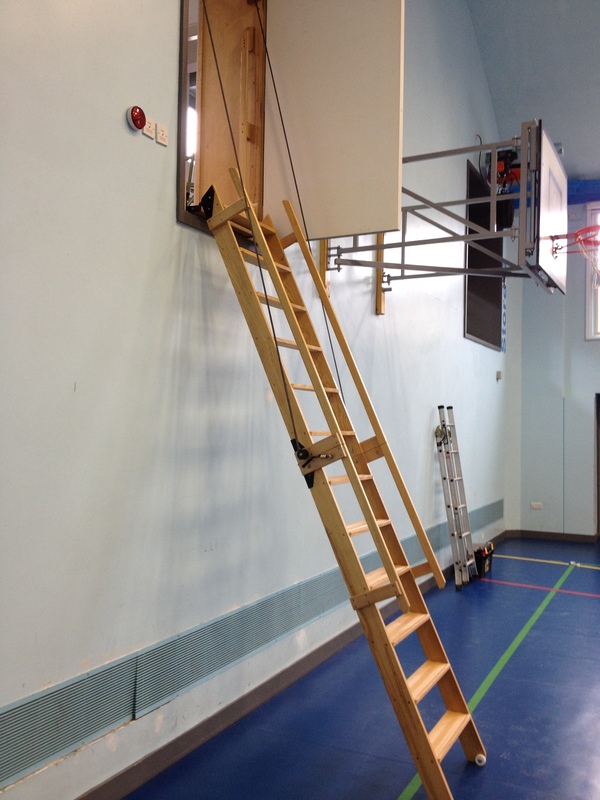 Although a smaller size ladder section than the Chilgrove, the Boxgrove is still built to the same exacting high standards and with the same materials as our other products. 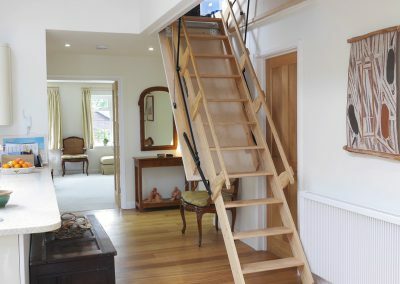 Made from sustainable hardwoods your Boxgrove electric loft ladder gives you effective, sturdy access to your loft space that encourages use. It is made to a size to suit you within the specifications below. 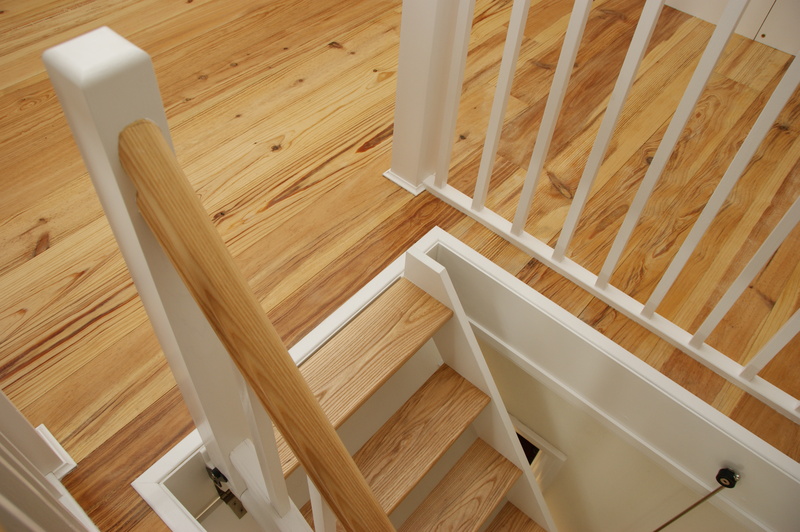 The Boxgrove is a fine enhancement to your home. 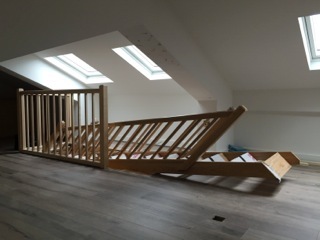 Maximum floor height is 3000mm depending on length of the opening. 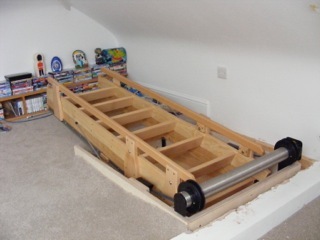 It can be built to the same dimensions as the Amberley. 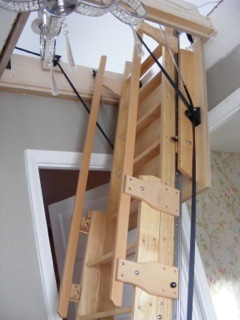 This ladder typically has a large opening for the door and shallower angles than standard loft access. 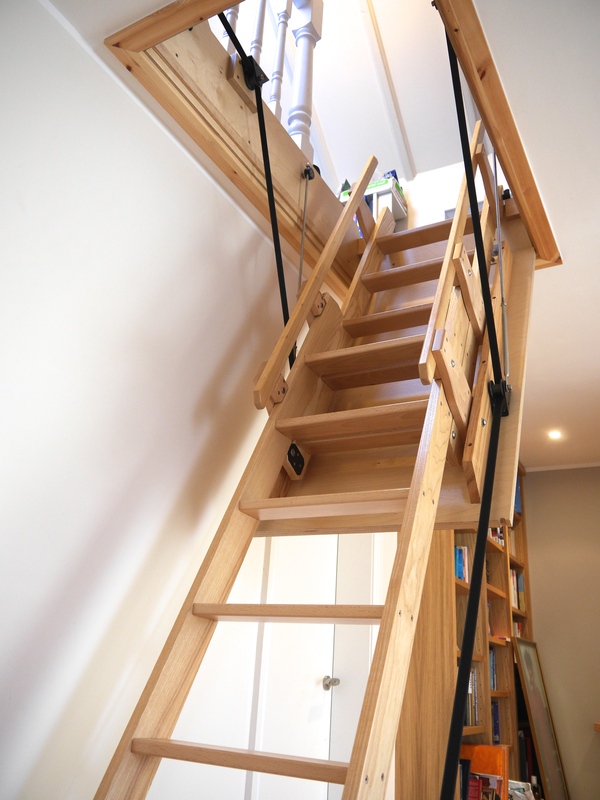 The smooth elegant action of this ladder is very impressive and will really add that extra dimension to the concept of loft usage! 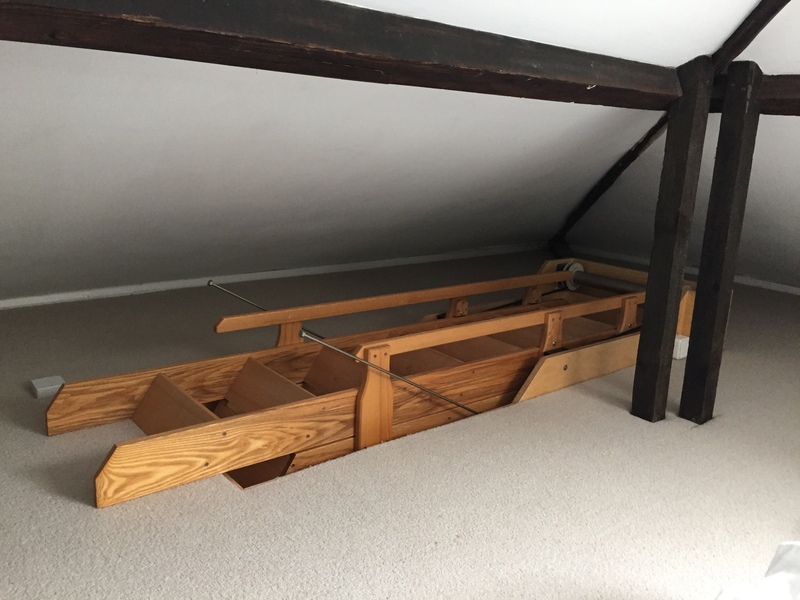 Maximum floor to floor height 4000mm depending on length of the opening. 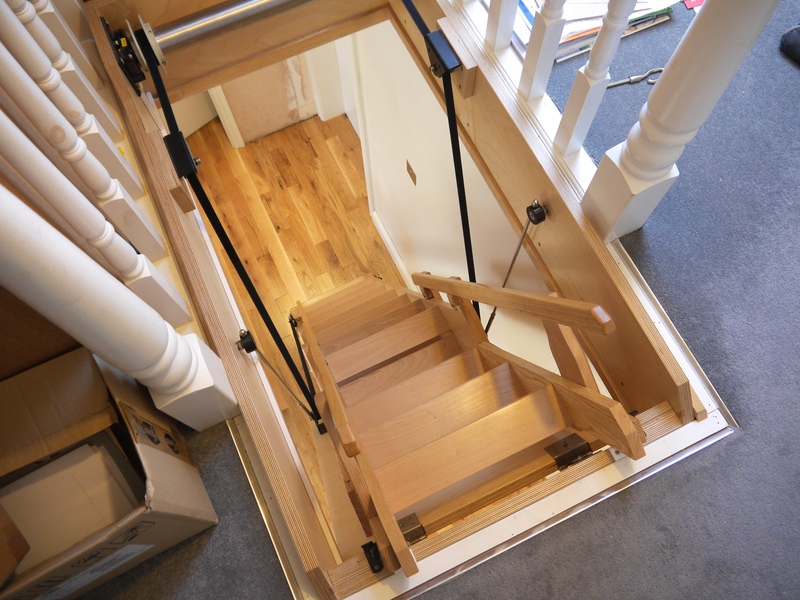 The Amberley is one of our highest spec electric loft stairways. 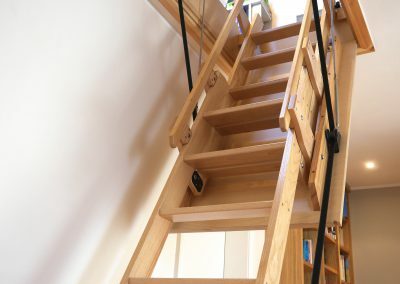 It has been designed to be able to have larger treads, a larger door opening and shallower angles than is usually possible, making this electric loft ladder feel even more like fixed stairs. 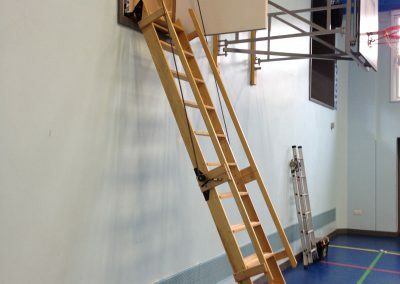 This gives confidence and encourages use. 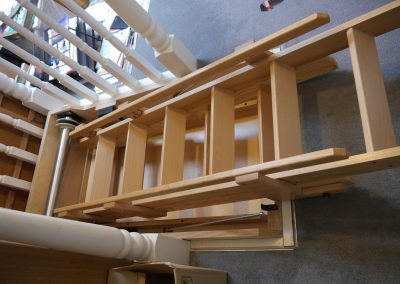 Less storage space is required than is possible with the Midhurst, due to the stairs folding action. 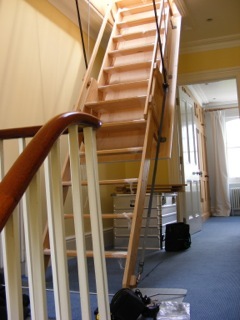 Since we launched it, the Amberley has proved to be the most popular electric stairway that we manufacture. 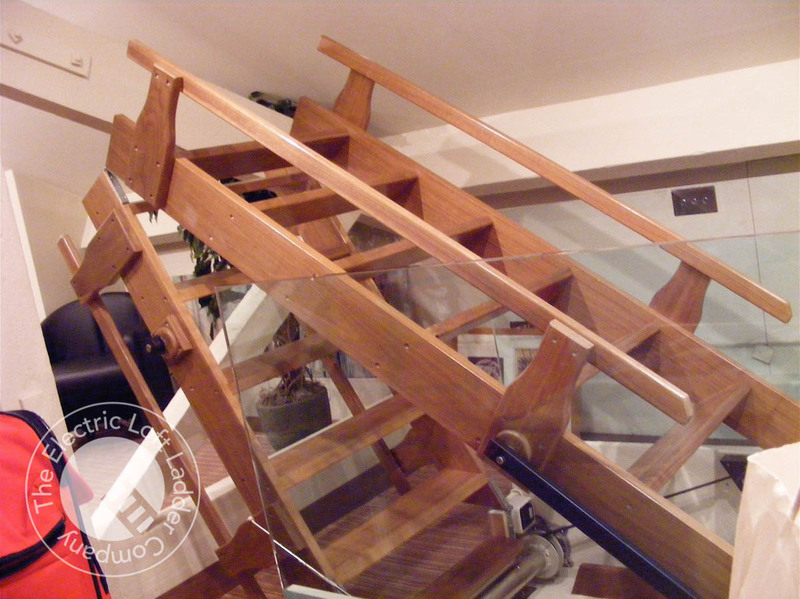 The typical structural opening length is between 1500mm – 1800mm, and width 820mm – 870mm. The Amberley combines functionality and style, and is produced using sustainably sourced hard wood, typically Beech and Ash, as standard. Crafted with care and attention to detail, the Amberley is an exceptional addition to any home or business. 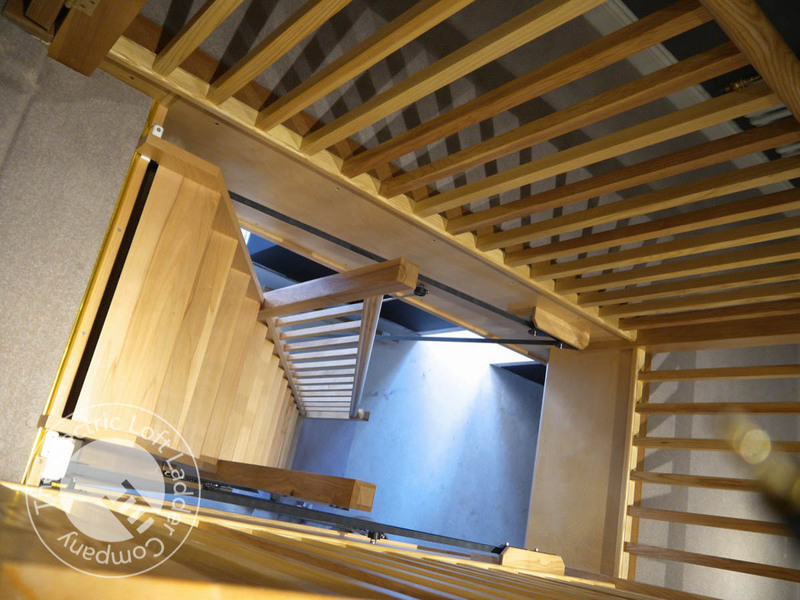 This is a bespoke stairway, designed especially to fit with your particular project, so it is essential that you contact us at an early stage of your project for advice on the dimensional requirements of this product. NEW FOR 2018!! — 50 degrees – please call for details. Prices exclude fitting,VAT and delivery. 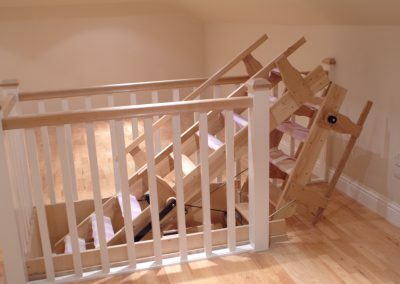 Excluding VAT, fitting and delivery. For the ultimate in luxury loft access we offer our top of the range, push button operated single section stairway, custom built to your floor to floor specification. 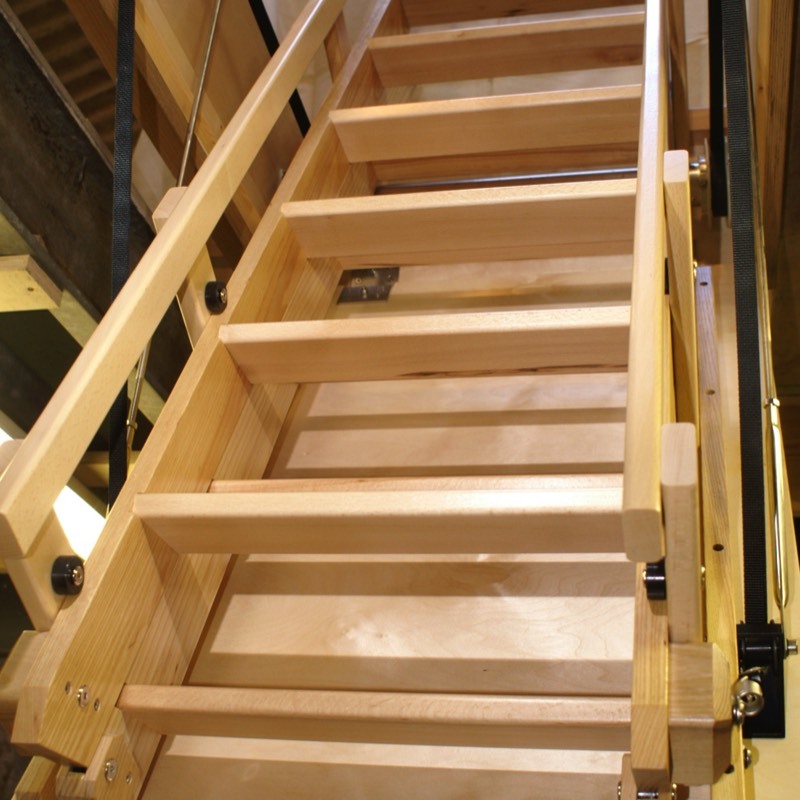 This electric loft ladder has our largest tread section and is generally shallower in angle of climb. With full newel posts and balustrading, this stairway represents the ultimate in electric loft access. 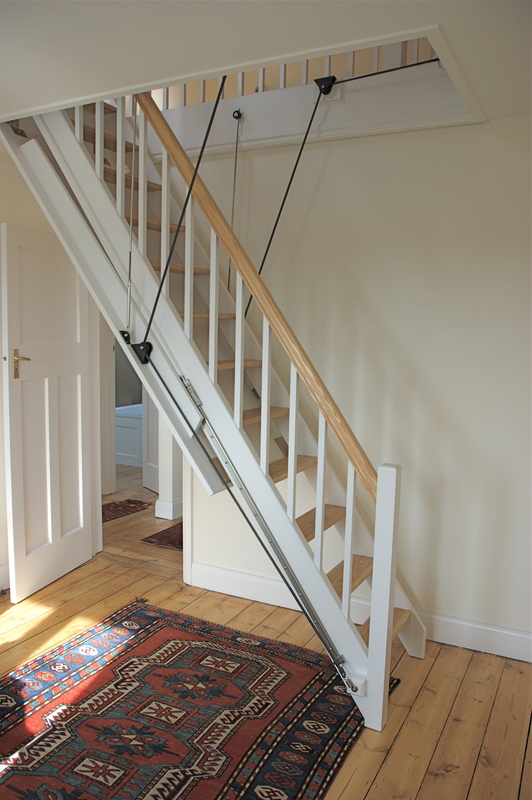 As with all of our ladders and stairways, the Midhurst also incorporates an emergency manual winding handle. Battery backup is also available. 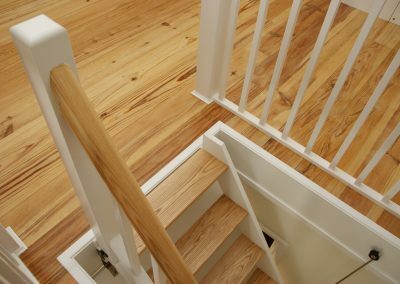 This stairway is commissioned to your particular specifications, so it is essential that you contact us at an early stage of your project for advice on the dimensional requirements of this product. 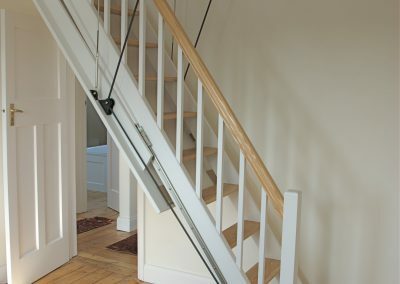 The Petworth electric loft ladder represents an innovative solution to the problem of gabled loft access or high level doors where a conventional loft ladder cannot be used. 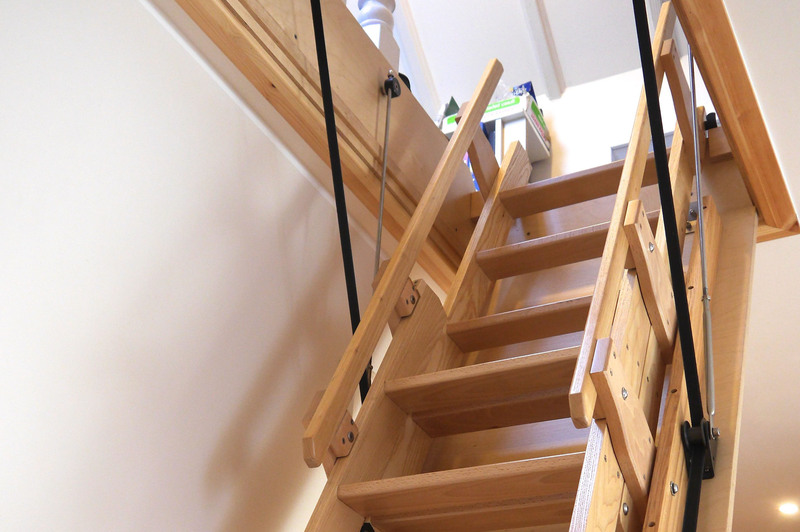 This loft stairway can come complete with an automated door! 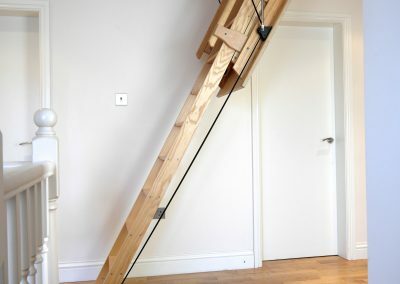 This is a most impressive ladder and is totally unique in its design and construction opening from a vertical wall rather than the usual loft hatch, and has taken years of research to develop. 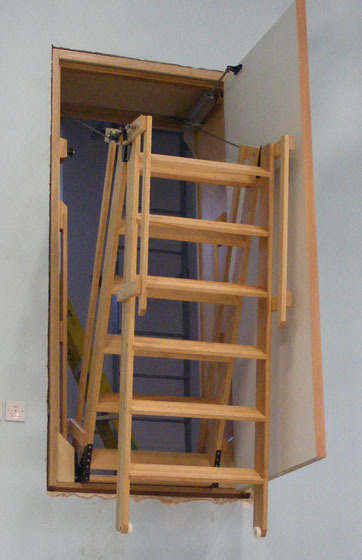 Doorways half way up walls present a unique set of problems with sensible and safe access that is not flimsy and is also easy to operate. 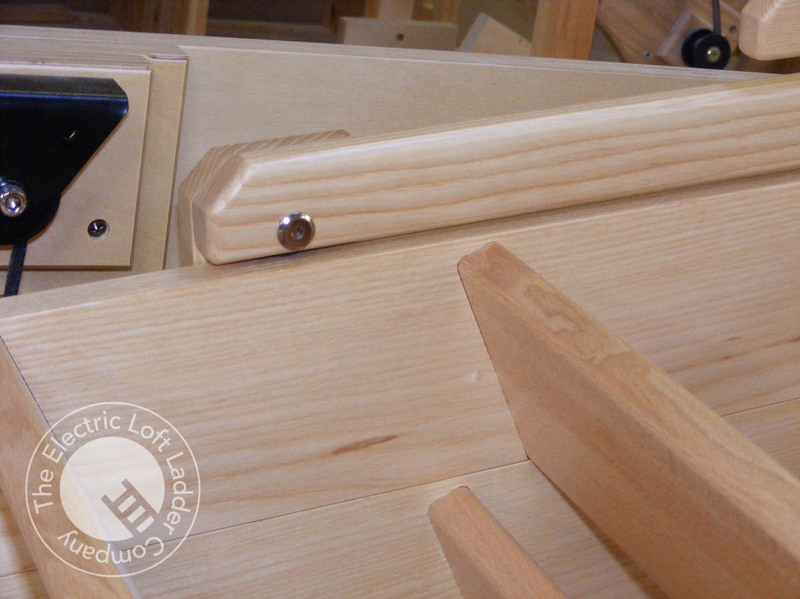 This product is not easy to build and this is reflected in the cost. 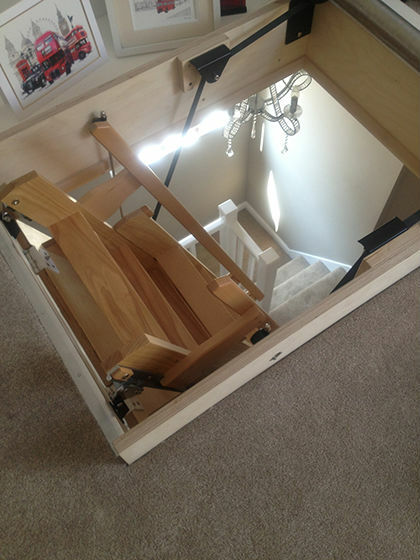 It does require a full size door and an achievable floor to floor height. Given how difficult this is to achieve we are truly proud of this outstanding product. 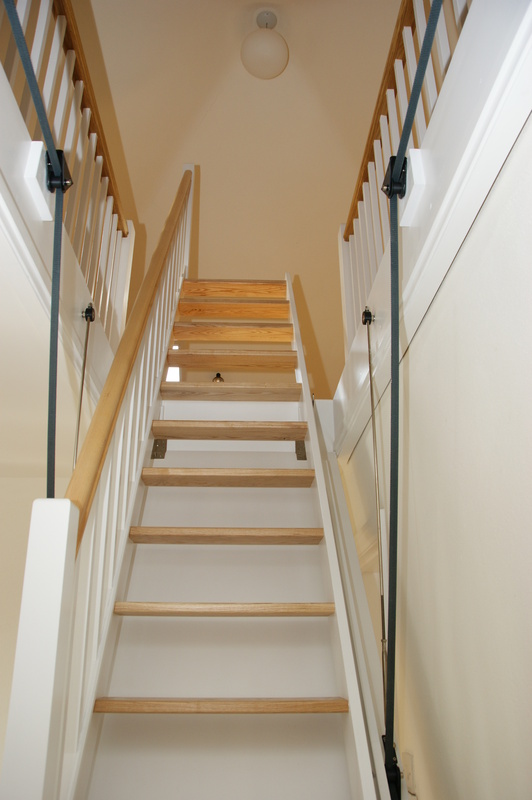 All of our Electric Loft Ladders incorporate an emergency manual winding handle and battery backup is available. 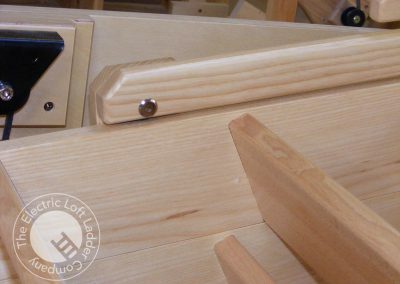 Manufactured using hard wood, typically Beech and Ash. 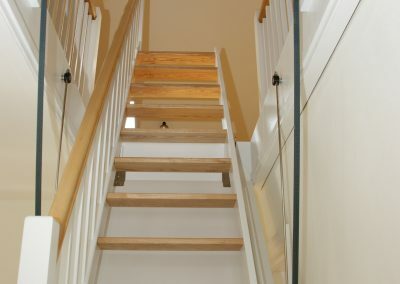 This stairway is built to your individual requirements, so please contact us at an early stage of your project for advice on the dimensional requirements of this product. 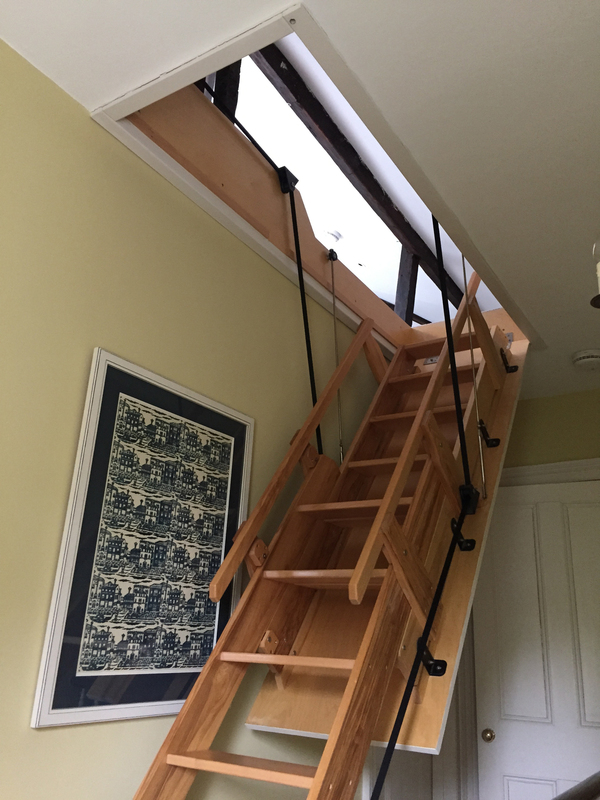 The Eartham double sliding electric loft ladder is designed for where most electric loft ladders will not fit due to short openings or locations with limited space above or behind the step off point. 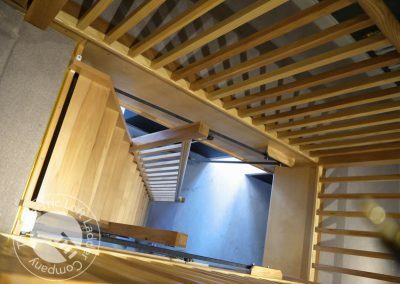 Using a more complicated sliding mechanism enables us to reduce the case size to 1050mm x 685mm (this is one of the shortest openings for any product on the market). 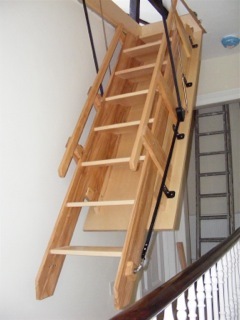 We can also produce it as a three-section electric loft ladder contained within the box. 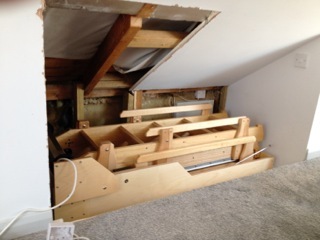 We have managed to do this without compromising any quality or ease of use. 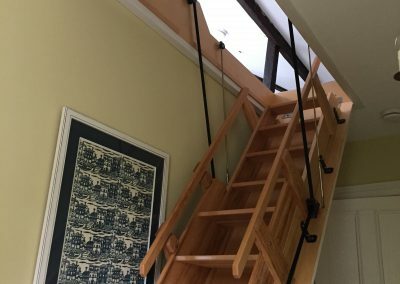 The Eartham Electric Sliding Loft Ladder represents an innovative solution to a problem of limited loft access where other ladders cannot be used. 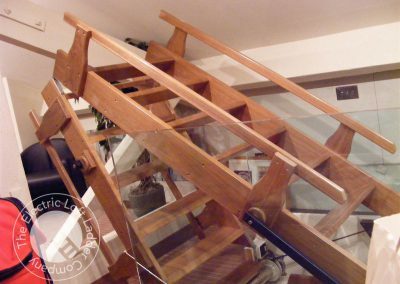 This ladder is made to order to your individual requirements, so please contact us on 01243 671555 as early as possible in your project. 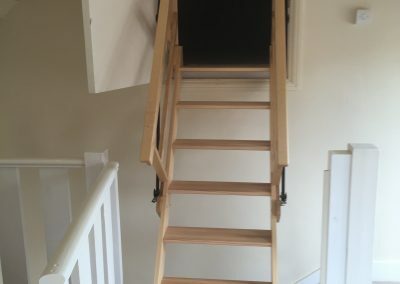 The Electric Loft Ladder Company is the UK’s only electric loft ladder manufacturer and has been making bespoke electric loft ladders and stairways for over 10 years.